Day two, February 3, kicked off with a presentation by Allen Brown, President and CEO of The Open Group, “What I Don’t Need from Business Architecture… and What I Do”. Allen began with a brief history of The Open Group vision of Boundaryless Information Flow™, which enables the break down of barriers to cross-functional organization when information is held in siloed parts. Allen and team used the word “boundaryless” that was started by Jack Welch in 2002 with the phrase “Boundaryless Organization”. This approach focused on thinking and acting, not technical. “Boundaryless” does not mean there are no boundaries, it means that boundaries are permeable to enable business. Allen also discussed brand actualization, and that organizations wishing to achieve brand recognition such as Nike and Apple must be aware of the customer journey. The journey entails awareness, evaluation, joining, participation, renewal and advocacy. The organization needs to learn more about the people so as not to segment, since people are not “one size fits all”. Business Architecture helps with understanding the customer journey. Business Architecture is part of Enterprise Architecture, he continued. A greater focus on the “what”, including strategic themes, capabilities and interdependencies, can add a lot of value. It is applicable to the business of government as well as to the business of “businesses” and non-profit organizations. 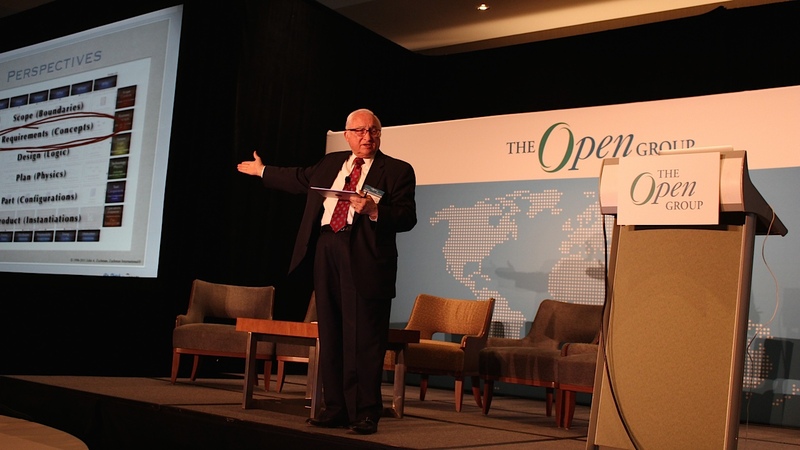 John Zachman, Founder & Chairman, Zachman International and Executive Director of FEAC Institute, presented “The Zachman Framework and How It Complements TOGAF® and Other Frameworks”. John stated the biggest problem is change. The two reasons to do architecture are complexity and change. A person or organization needs to understand and describe the problem before solving it. “All I did was, I saw the pattern of the structure of the descriptive representations for airplanes, buildings, locomotives and computers, and I put enterprise names on the same patterns,” he said. “Now you have the Zachman Framework, which basically is Architecture for Enterprises. It is Architecture for every other object known to human kind.” Thus the Zachman Framework was born. According to John, what his Framework is ultimately intended for is describing a complex object, an Enterprise. 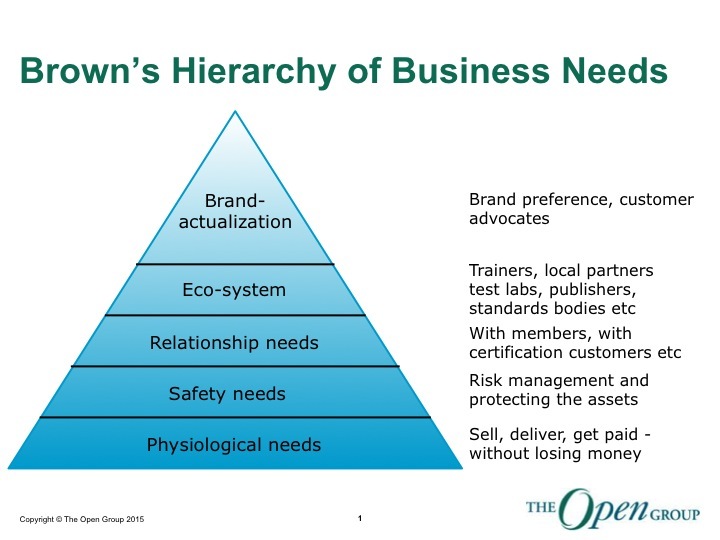 In that sense, the Zachman Framework is the ontology for Enterprise Architecture, he stated. What it doesn’t do is tell you how to do Enterprise Architecture. “My framework is just the definition and structure of the descriptive representation for enterprises,” he said. That’s where methodologies, such as TOGAF®, an Open Group standard, or other methodological frameworks come in. It’s not Zachman OR TOGAF®, it’s TOGAF® AND Zachman. Allen and John then participated in a Q&A session. Both are very passionate about professionalizing the architecture profession. Allen and John agreed there should be a sense of urgency for architecture to keep up with the rapid evolution of technology. The plenary continued with Chris Forde, GM APAC Region and VP, Enterprise Architecture, The Open Group on “The Value of TOGAF® Architecture Development Method (ADM) and Open Systems Architecture”. Chris was presenting on behalf of Terry Blevins, Fellow of The Open Group, who could not attend. Chris said, “Enterprise Architecture is a constant journey.” The degree of complexity of organizations or objects (such as airplanes) is enormous. Architecture is a means to an end. ADM is the core of TOGAF. Enterprise Architecture (EA) is nothing but a paperweight if there are no plans in place to use it to make decisions. Supporting decision-making is the key reason to produce an Enterprise Architecture. Chris noted sound decisions sometimes need to be made without all of the information required. EA is a management tool, not a technology tool. Allen Brown chaired a panel, “Synergy of EA Frameworks”, with panelists Chris Forde, John Zachman, Dr. Beryl Bellman, Academic Director, FEAC Institute, and Iver Band, Enterprise Architect, Cambia Health Solutions. Iver began the panel session by discussing ArchiMate®, an Open Group standard, which is a language for building understanding and communicating and managing change. One of the questions the panel addressed was how does EA take advantage of emerging technologies such as mobile, big data and cloud? The “as designed” logic can be implemented in any technology. Consideration should also be given to synergy among the different architectures. EA as a management discipline helps people to ask the right questions about activities and technologies to mitigate risk, take advantage of the situation and/or decide whether or not to deploy the strategies and tactics. The idea is not to understand everything and every framework, but to get the right set of tools for interaction and navigation. In the afternoon, tracks consisted of Risk, Dependability and Trusted Technology, Open Platform 3.0™, Architecture Frameworks and EA and Business Transformation. Presenters were from a wide range of organizations including HP, Tata Consulting Services (India), Wipro, IBM, Symantic and Arca Success Group. A networking reception was held at the Birch Aquarium, Scripps Institution of Oceanography. Attendees enjoyed a scrumptious dinner and experienced the wonders of ocean and marine life. A very special thank you goes to our San Diego 2015 sponsors and exhibitors: BiZZdesign, Corso, FEAC Institute, AEA, Good E-learning, SimpliLearn and Van Haren Publishing. Loren K. Baynes, Director, Global Marketing Communications, joined The Open Group in 2013 and spearheads corporate marketing initiatives, primarily the website, blog and media relations. Loren has over 20 years experience in brand marketing and public relations and, prior to The Open Group, was with The Walt Disney Company for over 10 years. Loren holds a Bachelor of Business Administration from Texas A&M University. She is based in the US.